With all the problems that the New York Mets have, who would have thought that they would be the team who, so far this season, has given Derek Jeter the best send-off. It is true, however. 2. An actual number 2 subway tile. 3. 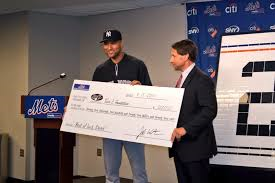 A check for $22,222.22 for Jeter's Turn 2 Foundation. Analysis: When I heard that this presentation was made hours before the game during a press conference instead of on the field in front of the fans, I shook my head. 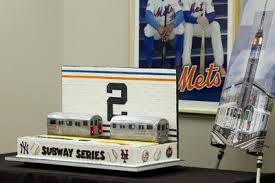 After thinking about it, however, the cake would be hard to see on the field, and the big screen in the outfield wouldn't do it justice. To see the entire presentation click here. Rating: On a scale of 1 to 10, with 1 being garbage and 10 being perfect-- 10! Great job by the New York Mets.